In this tutorial, we are going to see how to create a Docker Image for an ASP.Net MVC4 application. We will containerize the created image, run it locally and test it. For hosting an ASP.Net MVC4 application we need IIS, so we need a Windows Container (IIS doesn’t run on Linux container). To work with Windows Containers, we need either Windows 10 (Anniversary update) or Windows Server 2016. We are going to use Windows Server 2016 Datacenter VM running in Azure as our development environment. Lets get started by creating a Windows Server 2016 Datacenter VM in Azure. Fill in the required details like Name and Password. For Size, I have selected DS2_V2 Standard 2 Core 7GB RAM. I left out all the other default settings and created the virtual machine. Remote desktop in to the VM. Lets enable Container support on our VM. Run Powershell (Run as administrator) and run below command. Install Docker with following commands. If we do a docker version, we will see that Docker has been installed and running successfully. 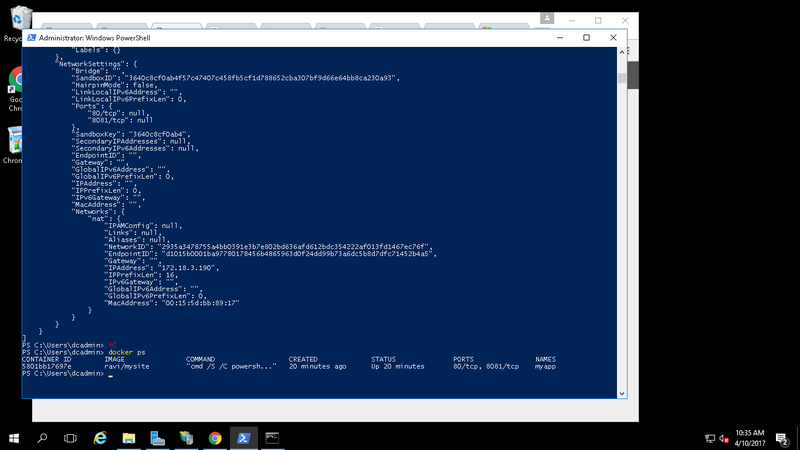 Now lets pull IIS Docker image from Docker Hub. Run the image using below command. As the Containers 80 port is channeling to VM’s 80 port, we need to create a inbound security rule for VM at Azure portal. NOTE: Ping –t is used as a watch to the Docker through which container will be kept running in the background. Otherwise the container will quit immediately after it is executed. We will use a different approach (demonstrated below of this tutorial) when actually working with an ASP.net MVC4 solution. We use a infinite while loop as suggested here. Navigate to Resource Groups, Select Network Security Group of our VM. Select the Inbound Security Rules. click Add. Create a new rule for HTTP 80 as shown below. Now when we browse VM’s Public IP Address, we should see Default IIS Page. To test with actual ASP.Net MVC4 application, lets first install Visual Studio 2017 RC on our VM. Download VS 2017 RC from https://www.visualstudio.com/vs/. Select ASP.Net and Web Development workload and click Install. After installation, open Visual Studio 2017 RC and create a new Web Application (MVC) with .Net 4.6.1. Run the application and we should see following Home screen. Right click the solution in VS 2017 and select publish. Select Folder. Navigate to published folder \bin\Release\PublishOutput. Create a Dockerfile with following contents (Remember this file should not have any extension). First of all it uses microsoft/iis as the base image. 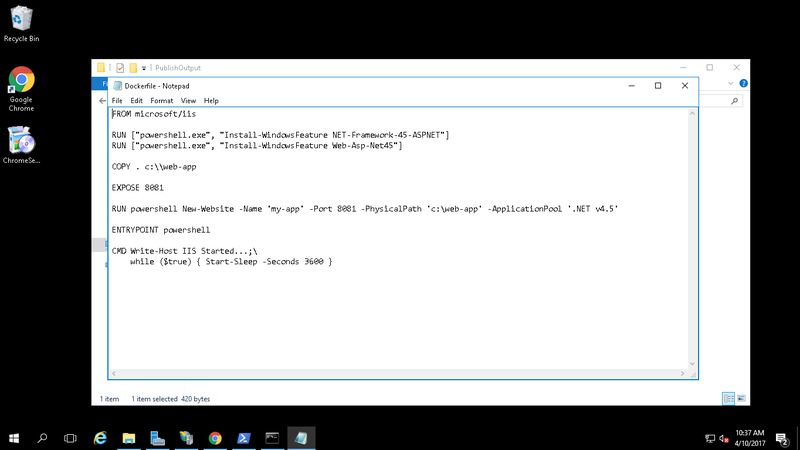 Then it enables ASP.Net 4.5 and Web features for IIS. It copies all the content from current directory (which is PublishFolder) to C:\\web-app. It then exposes 8081 port of the container. Finally it will create a new IIS Website at port 8081 and map it to C:\web-app directory (where we copied all artifacts previously). .Net v4.5 application pool will be used. Finally we will put a infinite loop with one hour, this is required to keep the container awake. Once above Docker file is ready, we will build our Docker image. Make sure PowerShell is in the context of PublishFolder directory. If we look at docker images, we will have two images now. Lets run the created image. As we are using 8081 port, we should add a inbound security rule for our Azure VM (in the similar way how we added for port 80 earlier in this tutorial). Navigate to the URL, we should see our ASP.Net MVC4 application up and running. I am Ravi and very new to docker containers. i just build the sample .NET application and configured in IIS and also deployed in windows container using windows server 2016 .When i run the IP address the site can’t reachable to me.How can i solve this. I enclosed the screen shots. @disqus_rQcQoOnwVR:disqus , As discussed offline, we will discuss about this error over weekend.